So, you want to find out more about SEO, or search engine optimization? Perhaps you’re simply interested in the term. Or maybe you’ve decided to investigate ways to increase traffic to your blog or website. Whatever the reason for your interest, you’ve come to the right place. In short, SEO is a marketing approach which is applied to websites. This approach makes it more likely for websites or blogs to be ranked highly on keyword searches conducted on search engines. With SEO, the text of a website is written in a way that makes it more likely for search engines to discover the website. SEO strategies also increase the likelihood that the website will be ranked higher in the results that internet users obtain from keyword searches. In essence, SEO strategies increase the potential for websites to be recognized by search engines, and then identified as better sources of information for a person looking to gain more knowledge through an internet search about a given topic. This article will explain how search engine optimization works, as well as how this information can be useful and relevant to bloggers and other interested parties like you. It will also provide a description of some basic SEO tips that you can incorporate into your own blog or website. 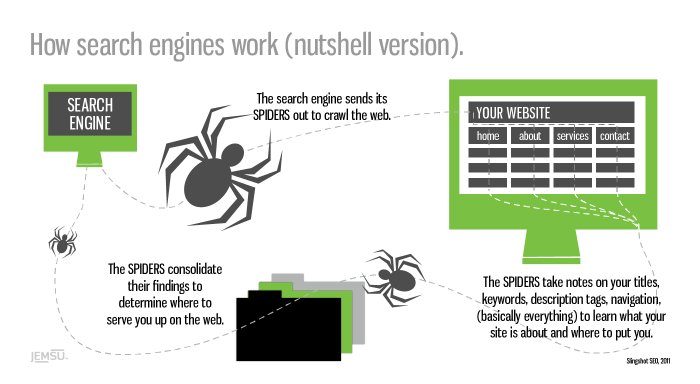 A search engine sends out feelers (some call it spider, or bot, or robot, or search bot). The feelers gather information about websites all across the internet. They analyze information about a website, including the words that appear frequently on it, its titles, description tags, and navigation. These are just some of the characteristics of websites that are evaluated by these feelers. After the feelers obtain information, they categorize all of the websites that they find. Then they classify websites based on these analyses. The feelers deliver this information back to the search engine. Based on the information that search engines obtain from these feelers, they essentially list and rank websites according to a wide variety of factors (over 200 factors, in fact). A website’s rank is determined by the information uncovered by the feelers. One significant factor considered by the feelers is how many other websites link to a particular site. Websites acquire a score or ranking which is partially related to the number of sites that link to them: this is called the PageRank of a website. A website’s Page Rank is also impacted by the reputation of the pages which link to that particular site. If a site has a higher PageRank, it will likely end up appearing earlier in a given key word search entered into a search engine. This information is important to you because SEO can be an important approach that will help you increase traffic to your website or blog. Indeed, the number of persons and potential visitors who are even aware of your blog can be highly impacted by SEO practices. The feelers from a search engine have to analyze your website and its content based on the 200 factors. This evaluation will determine how high your blog ranks on search terms related to your topics of interest. After all, if you’re like most people, you start to look for new information through some sort of search engine like Google or Bing. Most people do not go beyond the first page of search results that a search engine finds. As a result, the websites which are most clicked on are those which appear on this first page of results. Therefore, it’s important for your blog or website to be one of the first ones listed. SEO is a strategy and set of practices which increase the potential for your blog or website to be included in the first page of results for a specific search. One way to think about the feelers utilized by search engines is to consider them as fulfilling the responsibilities of librarians. Like a librarian who has good knowledge of her library’s collection, a search engine has to be aware of the contents of all the webpages available. A search engine needs a system which allows it to search all of the available sources on a given subject, and then be able to determine the relationships between these sources. The system of a search engine also has to provide it with recommendations of the best sources for people interested in obtaining information about a particular topic. To be able to make these recommendations, search engines use algorithms to analyze the contents of webpages. These algorithms allow search engines to provide search results for interested people. Algorithms serve as the systems which best help people find precise information about the keywords they type in. These algorithms help search engines determine which websites will provide the best, most specific, and most useful information for people according to the requested search terms. With Search Engine Optimization, you can enhance your website so that it becomes ranked more highly by the systems of search engines. SEO as a strategy can allow your website to become identified by search engines as a strong candidate to provide relevant and useful information to people. A search engine’s feelers use several critical factors to evaluate websites. These can include the words used in a website’s text, the titles used on a page, the links used on a webpage, the words used to create the links, and the overall reputation of the page. These characteristics of a website are important because they are some of the criterion used by the algorithm to select websites. The algorithm considers which words correspond with a particular search to try and identify which pages will provide the best and most precise information. It analyzes titles because they are considered small summaries of a website’s content. The algorithm evaluates how many pages link to another page as well as the words specifically used to create the links. After all, if other well-respected websites provide links to one website, that website is likely to have a higher ranking overall. Finally, when a website updates its content regularly, provides fresh information to its readers, and embeds new links in it on a regular basis, it is likely to be considered more reputable by search engines based on the results of their algorithms. 1. The results obtained by a search engine matter because they are based on rankings made by an algorithm. 2. Search Engine Optimization (SEO) allows your website or blog to obtain a higher ranking. The words that you use repeatedly on your website or in your blog are important. The kinds of titles (both page title and H1, H2, H3 tags) that you use to label sections on your website or blog are critical – They serve as small summaries of your website’s content. The pages that link to your blog or website are another significant factor. The page loading speed – Google loves fast site. The words (we call this anchor text) that you use to serve as the links themselves are also important. Now that you’ve obtained this information, go out and play!